My Home and Garden: How on earth do you get an injury from Coconut Oil? How on earth do you get an injury from Coconut Oil? 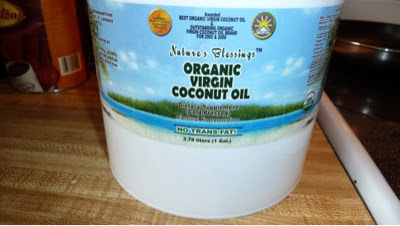 Look at this beautiful gallon of Coconut Oil I bought. We go through a lot of it now, so I thought I'd go big or go home. The lid was a bugger to get off. I mean it. My husband and I worked together trying to pry the lid off. We used a bottle opener, a towel and a screw driver. I was holding the bucket and Allan jammed the screwdriver up under the lid. It was lifting off the counter a bit even with me holding it down. It was unbelievably stuck. He gave it the old college try and really jammed the screwdriver up under the lid, container slammed down. 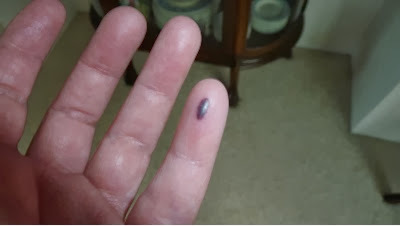 Pinching the skin on my baby finger under the sharp bottom edge. Two days later this is what it looks like. You know when Buddy says in the movie Elf "I can feel my heart beat". Yeah that kind of hurt. I just had to post a picture of the breakfast Allan made for us. 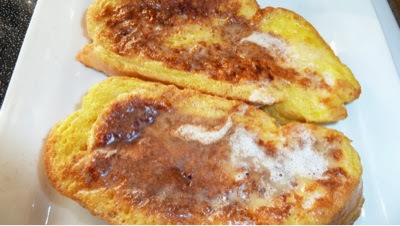 This is his beautiful French Toast with butter and maple syrup.